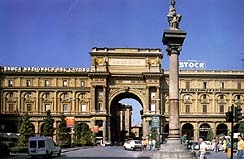 Florence Capital of Italy: the Town Center is "Given New Life"
14. 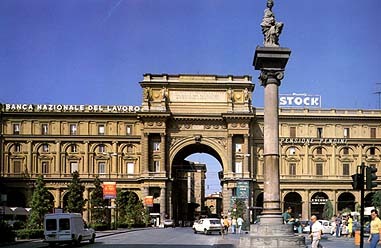 Florence Capital of Italy: the Town Center is "Given New Life"
In 1859 the Lorreines left Florence for good. After the second War of Independence and after Tuscany joined the Savoy Reign of Unified Italy, Florence is the Capital of Italy for 5 years (1865-70). The historical city centre underwent intensive urban renovation (which the Middle classes deemed necessary for prestige, but also for speculation, disguised beneath a humanistic and historical formula) which completely destroyed the Old Market, together with its Jewish quarter, near to the present day Piazza della Repubblica rebuilt on this site, (twice the original size) and marks the destruction of the organic connection of a thousand years of urbanistic stratification, substituted with an anonymous geometrical layout of buildings, amongst which some monuments have been left intact, emerging with no connection to the buildings around them.